There are two things I couldn't rely on in Scotland: The weather forecast and cell phone coverage. 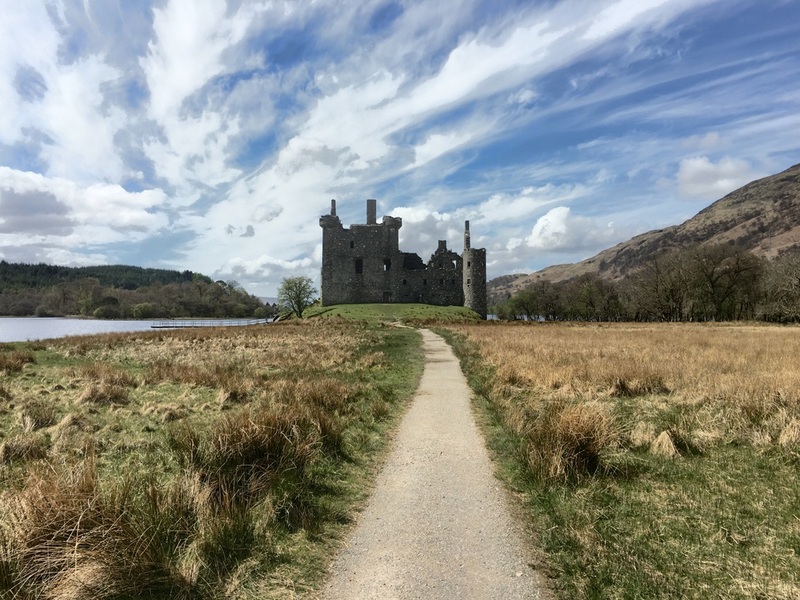 So my super fancy iPhone navigation system was basically useless for finding Kilchurn Castle. And so was the GPS in the car! In Edinburgh, I got an upgrade (Thanks Sixt!) to a mega high-tech car (I imagine an apple car being equipped like this). But the GPS in the car also relied on a cellular connection to calculate the route. Nature : Technology = 1:0. Before you ask: There was absolutely no road sign to the castle. So I had to use the medieval approach: asking for the way once I arrived in Dalmally. The only one around I could ask was a friendly Scottish farmer who had an incredible Scottish accent. I hardly understood a word and could only pick up the words "left .... right ... bridge ... too far". I drove back to the A85 and soon reached a small, unmarked, gravel car park right near a small bridge. The castle was not visible from the car park. So I started to hike in the direction where the castle was supposed to be. Finally, the first sign that I was on track. "To the castle" sounded good. After a few minutes, I arrived at a railway bridge. It was damn low, which I learned the hard way (literally!) and finally I got a glimpse of the castle and it was not a kind of illusion because I hit my head on the low bridge. 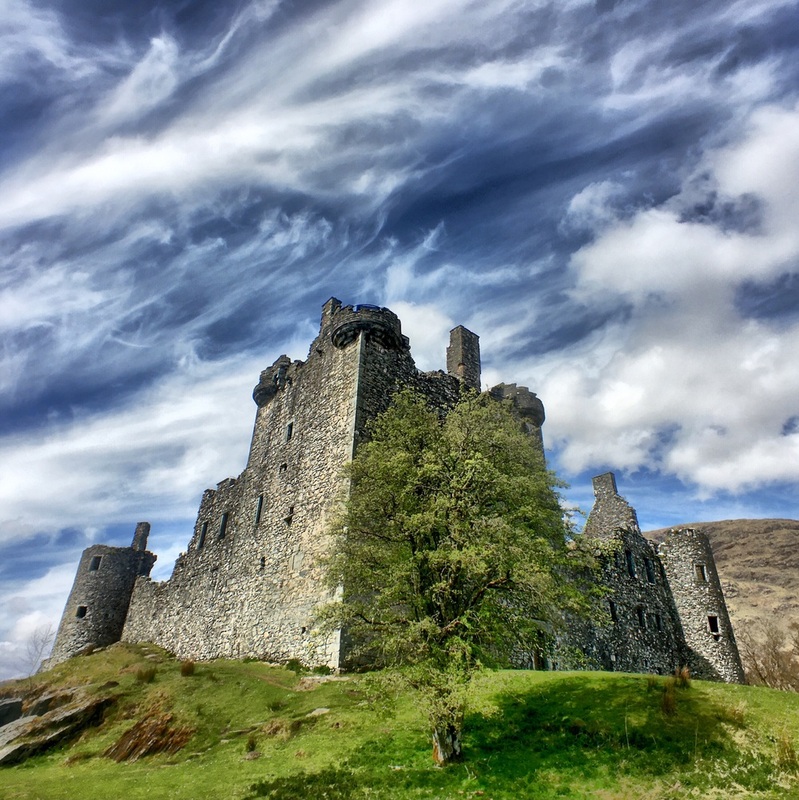 Kilchurn Castle from the distance. Though all websites mentioned that the castle is accessible, it wasn't. So I could just walk around this medieval structure. The best view for a photo is the left side with the green tree. This perspective illustrates the symmetry of the castle well. I was lucky that day and had an impressive sky with beautiful clouds after two days of rain. Such a scene is perfect for ProCamera [iTunes App Store Link] and HDR. The HDR modes are available in ProCamera with an affordable in-app purchase. The HDR modes offer various auto and manual modes. If you've purchased the low light modes as well, you get a "Low Light HDR mode" as a bonus. In total you get 5 different shooting modes along with 4 different HDR presets. I prefer to use the "AMEB" mode that allows me to manually set the exposure bias for all three HDR exposures (high, normal, low) manually. My previous experience and the results from using the auto modes were mixed. 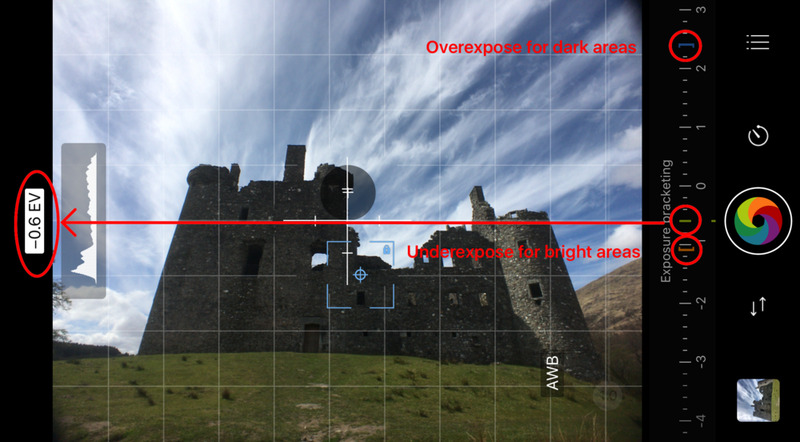 For almost all shots at Kilchurn Castle, I decreased the middle exposure a little (-0.5 to 0.7), set underexposure bias to -1 to get the sky right and used a huge overexposure of +2.5 to brighten up the castle and get more structure in the castle. Using AMEB is tricky and it took my a while to figure out how to set the exposure bias to get good results. Here's one of those shots where I got it wrong. Look at the clouds and the grey "aura" they have. I found to get the best results decreasing the exposure bias for the middle shot slightly and then setting dark and light to -1 and +2 respectively. To get the entire castle in the frame, I used the Moment Wide Lens. You can read my review about it here. One final tip: Always check the results of HDR on site, especially when using AMEB mode! And check it thoroughly so you can reshoot if it didn't work out.